One full-color counter sheet, one token sheet, two double-sided 21" × 32" maps, and a 60-page rulebook. Huge. Invulnerable. Invincible. Awesome. A moving mountain of metal and firepower, untouchable and unstoppable. This is an armored fighting vehicle on the move. Like the Juggernaut of old, the AFV crushes all in its path. 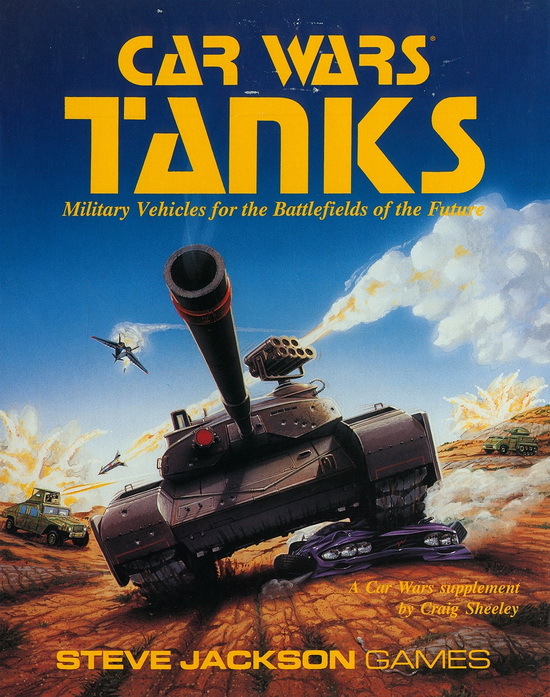 Car Wars Tanks provides complete rules for these vastly potent war machines. Build any kind of AFV, from humble mini-personnel carriers to giant hundred-ton supertanks. Weapons and armor too massive for simple cars and trucks make these plated horrors more than a match for anything in any arena. Tanks are the true rulers of the road – and anywhere else! The military battlefield is incredibly lethal and complex. Infantry equipment, hidden movement and spotting, electronic warfare, and artillery rules portray a battlefield where the average Car Wars car has a lifespan measured in seconds. Only the mighty survive – Tanks. 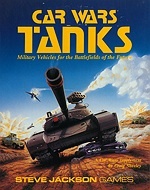 Car Wars Tanks is a supplement to Car Wars. You must have the Car Wars rules to play.